The IRS certainly deserves lots of condemnation for its rogue actions, including a $200 fine for a taxpayer who supposedly underpaid his tax bill by 4 pennies. But the tax-collection agency also should be criticized for blundering incompetence. In the past, I’ve mocked the Internal Revenue Service for sending checks to convicts. Now it’s time to rip the bureaucracy for its stunning failure to guard against fraud in the so-called earned income credit program. And we’re talking big bucks. Here’s a blurb from an AP report. More than $10 billion a year in tax credits for low-income families go to people who don’t qualify for them, and the Internal Revenue Service isn’t doing enough to stop them, a government investigator said Wednesday. Using the tax agency’s own numbers, the investigator said about quarter of all earned income tax credits go to families that don’t meet the requirements. The IRS has known about the improper payments for years but has not done enough to stop them, said J. Russell George, the Treasury inspector for tax administration. From 2003 to 2009, improper payments have totaled at least $70 billion, according to a report issued by George. In 2009, between $11.2 billion and $13.3 billion was improperly paid out. Bush and Obama have dramatically increased the IRS’s budget in recent years, but that money obviously is not being put to good use. The time has come to downsize the IRS. This video provides plenty of evidence. on February 12, 2011 at 8:59 pm Sean L.
I know that image of a man in black hat with “I.R.S.” was one of convenience, but just so people aren’t confused, International Record Syndicate produced some of the best alternative rock of the 1980’s including R.E.M., The Go-Go’s and Oingo Boingo. Very much looking forward to your comments on how the Republicans can win the inevitable showdowns to come. 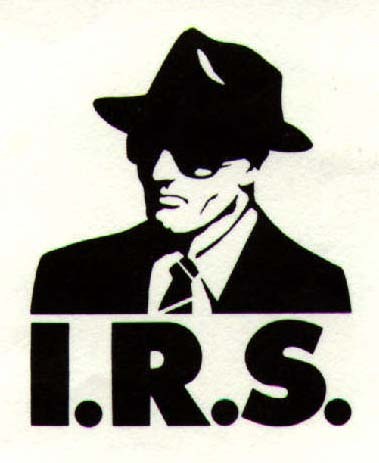 on February 11, 2011 at 9:52 pm The IRS: Incompetence on Steroids « International Liberty « Tax explained to you.